The popular instant messaging app WhatsApp might adopt some features from its parent company, Facebook. The messaging giant is testing some new features that might be coming to the app soon. The features include a 'Like' button similar to that of Facebook and a 'Mark as Unread' feature for chat messages, AndroidPit reports. Ilhan Pektas, WhatsApp beta tester, recently claimed that a future WhatsApp update will introduce a 'Like' button for images, indicating the company might allow users to Like their friend’s profile picture and images shared in groups as well. There aren't many details about the new features yet, but if implemented, Like button feature is something that could improve group chats. Besides implementing Like button, WhatsApp is also planning to introduce a 'Mark as Unread' feature to chat messages that will offer recipients ability to mark any message as unread, so that senders will not get the blue ticks. WhatsApp recently brought few improvements to group chats which includes, the ability to see who is typing, blue ticks for read messages, group administrator’s ability to assign other members as admins, as well as increasing the number of group members. And now, this new 'Mark as Unread' feature will give users the ability to mark a message as unread. Keeping in mind that awkward situation when a recipient have read the sender’s messages but isn’t able to reply instantly, WhatsApp might soon provide you undo your read chats as unread. This new unread feature was first spotted by a Spanish website ADSLZone after it obtained some internal WhatsApp translation document. Both of the above features do sound interesting and are really needed by most of the WhatsApp 800 Million users. 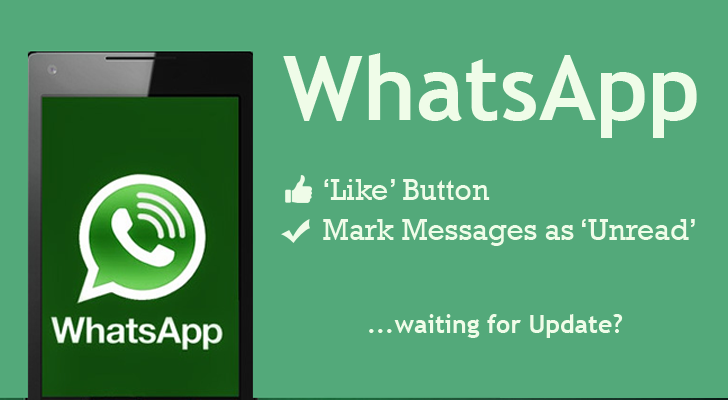 However, currently it is difficult to say if these features will make it to the next WhatsApp app update.